The Redesign, a month later..
It’s been a little over a month since I launched the third redesign of Frish.nl and the response has been absolutely amazing (and overwhelming at times). Almost everyone seems to love the new design and it’s been picked up by some of the largest design showcases in the world. 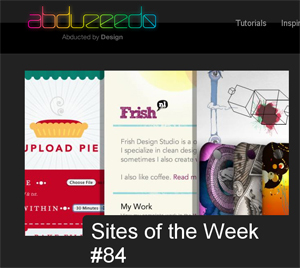 To name a couple: Site of the Week at Abduzeedo, Featured at CssMania, Textures In Web Design: Examples And Best Practices at Spyre studios, Featured at DesignFlavr, Featured at DesignSnack and the list goes on and on. I’ve also been asked to do an interview twice. Luc Arnold interviewed me for Spicy Webdesigners and you can read the interview here: Rogier Strobbe is the man behind Frish Design Studio out of the Netherlands. And fellow dutchman Edgar Leijs interviewed me for a dutch web magazine called Heeftstijl about the state of dutch webdesign. You can read the entire interview here: Klompen, tulpen, kaas en webdesign? (if you can read dutch off course). A lot of people wanted to know what font I used for the logo. It’s actually an adaptation of Rockwell, called Sketch Rockwell. The pageviews went through the roof and my site skyrocketed into the Alexa top 100k (even though that doesn’t really say anything, does it?). But it’ll be interesting to see if I can keep the pageviews on the same level they’re at now. I’ve got some interesting posts coming up! So here it is, the third incarnation of Frish.nl. Wow, I can’t believe I actually finished the site. I think I started working on the design like a year and a half ago, but you know how it goes, sometimes life, work and other responsibilities get in the way. Sometimes I would work on the new site for a couple of hours, followed by months where I didn’t work on it at all. But I wanted to finish it before the year’s end, and here it is! Still needs some tweaking here and there, but overall I’m pretty satisfied with the result. I am still running WordPress, but I also moved all content from my Singapore-powered portfolio site to WordPress. After all.. it’s much easier redesigning when you only have to build templates for one CMS. My portfolio is now located at http://frish.nl/work. I tried to keep the amount of plug-ins used to a minimum and build most of the site using standard wordpress functionality (like custom frontpage and using the built-in wp functions). The plug-ins I used: Akismet (off course), Breadcrumb NavXT, Contact Form 7, Google Analytics for WordPress, Page Sidebars and Twitter Tools. De verhuizing van gister is niet helemaal vlekkeloos verlopen en waren er een aantal posts verloren gegaan, maar alles staat nu weer op z’n plek (en weer op een andere server :)). De comments van gisteren zijn echter wel verloren gegaan. De verhuizing van deze site waar ik enige tijd geleden over schreef, is vannacht helemaal afgerond, en dat zou onder andere te merken moeten zijn in een snellere laadtijd/performance van deze site (en achter de schermen zijn er ook enige veranderingen, maar daar zal u verder niets van merken). Mochten er nog rare dingen te zien zijn, dan hoor ik het graag. De server waar deze site op draait gaat overgezet worden naar een sneller en krachtiger netwerk. Alhoewel de site niet offline zal gaan, zal de hostname van mysql wel veranderen. Terwijl alle referenties naar de hostname veranderd gaan worden, kan de site enige tijd mooie errors produceren. Dat u het vast weet. Contact is tijdelijk offline in verband met abuse. Het is compleet aan me voorbij gegaan, maar frish.nl is ondertussen alweer een jaar oud! De eerste post was namelijk op 26 september 2003.